If you’re a new pet owner, you may be surprised by all the necessary tasks and things it takes to raise a pet. For example: the cost of food, the veterinary visits, daily activities such as walks, trips to the dog park, and did you ever imagine the grooming upkeep of a pet? Maintenance grooming of your pet varies by type of pet and breed. Some breeds need more routine upkeep of their coats. They may require more frequent hair cuts or trims and daily brushings to keep their coats from getting matted. Nail trims are also recommended for all dogs about once a month. Ear cleaning should also be incorporated into your pet’s grooming routine. Pets can also develop cavities, just like humans. Most grooming facilities offer teeth brushing, and for a more thorough cleaning, ask your veterinarian. 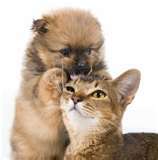 Many think grooming is just for the dogs, but cats sometimes require upkeep too. Cat’s fur tends to require brushing and occasional hair cuts to keep from matting. It’s not necessary to cut the nails of a cat, but if you want to keep them from scratching you when you pick them up or tearing apart your furniture, you may want to consider routine nail trims. Don’t forget about your cat’s ears and teeth, they too may need some cleaning. 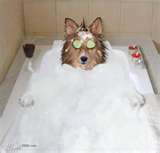 Some pets are self-groomers, but still require some help to ensure that they are properly groomed. Grooming isn’t just about keeping your pet’s coat clean, maintenance of all parts help in keeping your pet more hygienic and contributes to their physical appearance. Check with groomers in your area, some specialize in hair cuts/bathing of certain breeds; many also do a variety of breeds. Most groomers will need to assess new pets and speak to the owners about their temperament; you can schedule appointments to guarantee a convenient time for you and your pet. Here’s to a clean, healthy, beautiful pet!